Although all-in-one water cooling systems are nothing new, their rise in popularity is something very recent. We have watched as multiple companies have launched products designed bring “enthusiast” level cooling to the masses. This type of move is also nothing new as we have watched it happen with RAID, SLI, and many other items that were once only for gamers and other computer enthusiasts Still what many do not know is that most of these companies all buy their parts from the same place; Asetek. 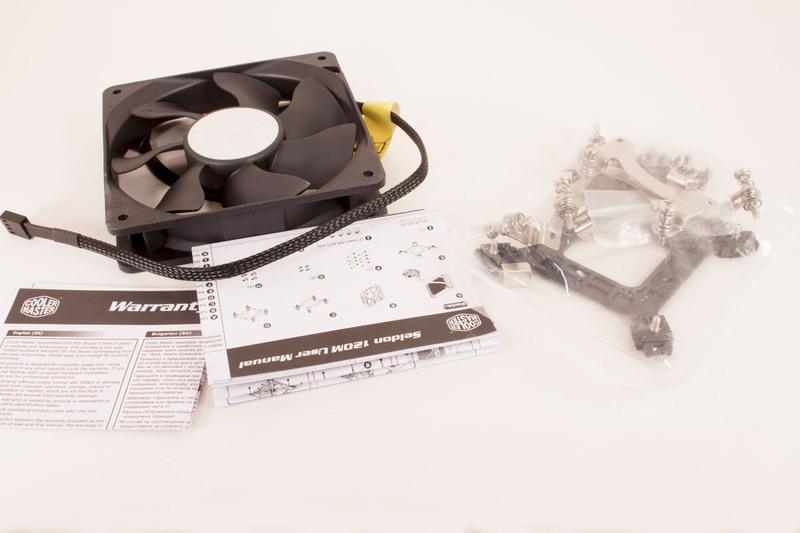 This company makes great water cooling products and they resell the pieces to others. Now, while that represents most of the market there are some that still build their own; one of these is Cooler Master. Back at CES 2011 we were allowed to see a prototype water cooling unit and we knew that they were looking to do something very different. Now in last months of 2012 Cooler Master has released their work. 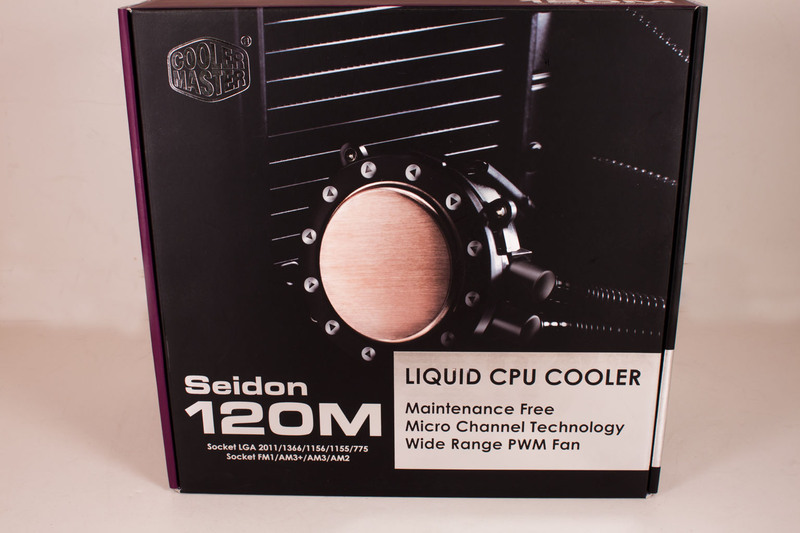 Today we will be taking a look at the Seidon 120M all-in-one water cooling unit to see if all of Cooler Master’s hard work has paid off. The box that Cooler Master has put the Seidon is a nice looking it combines Cooler Master’s Purple, the Silver for their 20th anniversary and black. Overall the effect is good. On the front you have an artistic picture of the Seidon’s cooling head and in the background you can see the cooling fins. The head is there to make sure you know that you are not getting another Asetek rebrand with the Seidon, but are getting something new. On the back of the box, as if to enhance the impression that this is Cooler Master’s own design there is a technical drawing and specifications laid out as if you were looking at the original designs. It is a subtle but impressive effect. 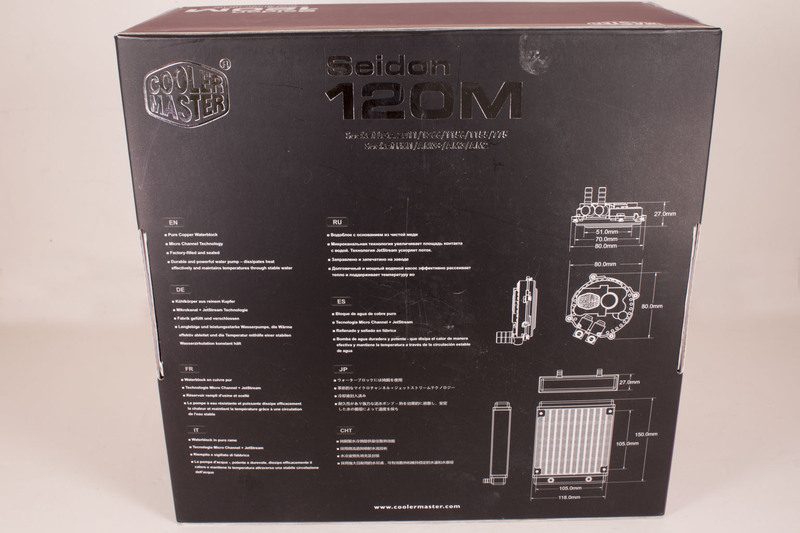 After you are finished marveling at the box you will find that Cooler Master has included everything you need to mount the Seidon on just about any consumer CPU you can think of, even back to the LGA 775 socket. Our video below shows you all of this in more detail and also shows you how to mount the Seidon to an Intel LGA 2011 socket. Overall we are impressed with things so far. 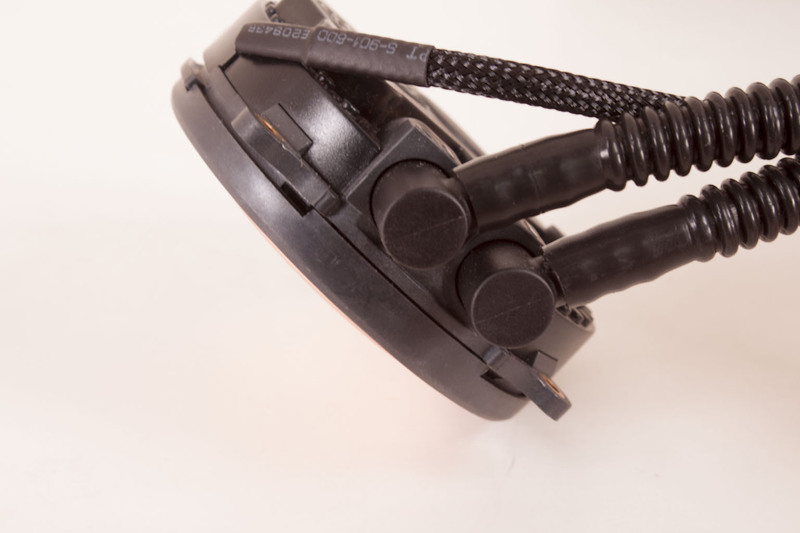 As we mentioned the Seidon is a new design from Cooler Master, but that really only applies to the cooling head and the integrated pump. 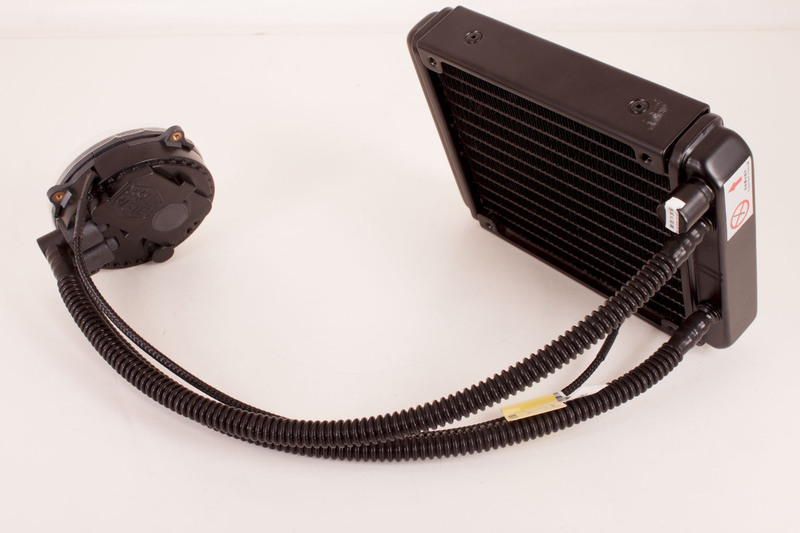 Other than that the rest of the product is very similar to what you would get with any other all-in-one cooling system. 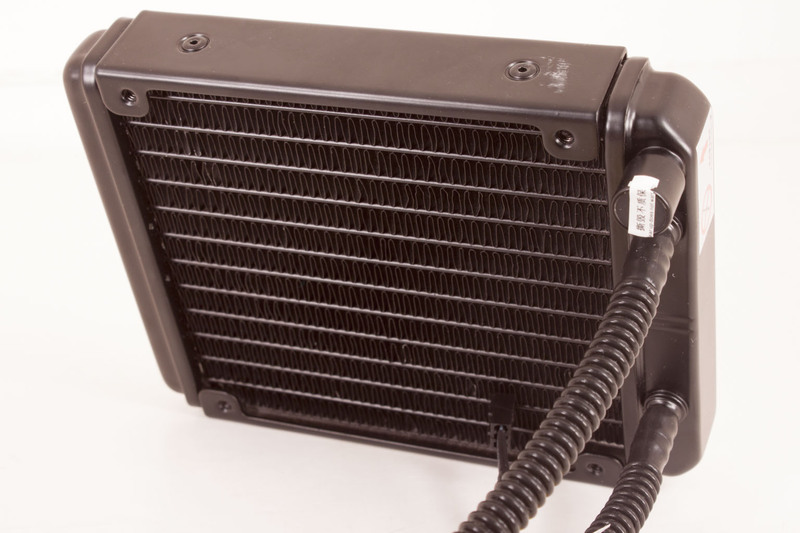 The radiator, tubing, etc are items that you can tinker with a bit (thicker, or larger radiator etc), but are going to be common around the market. 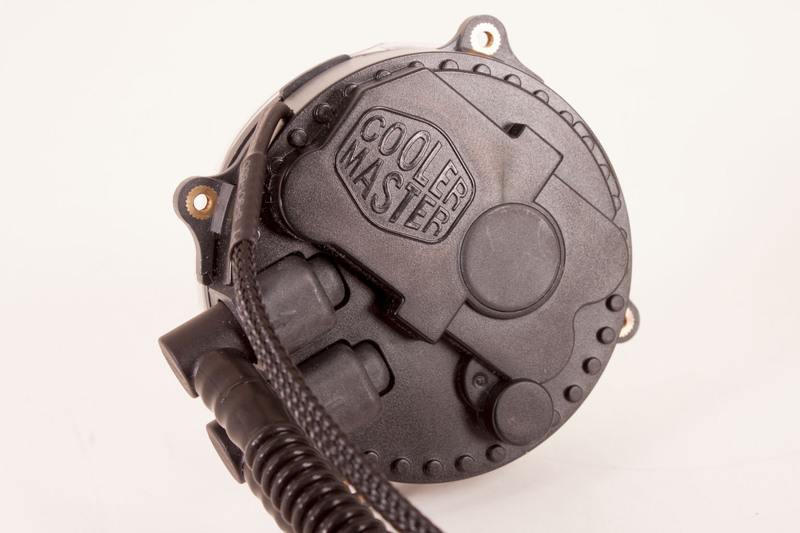 Still the cooling head is one of the most important pieces to the cooling puzzle. Here is where most companies rely on Asetek to give them a working solution. Instead of following the market Cooler Master started working on a solution for this a few years ago. As we mentioned earlier we saw one of the first prototypes back at CES 2011, but the back then the cooling head was square and you could tell it was far from complete. When we asked when it would be out, we were told: “when it is ready”. Most of this work went into the cooling head which is one of the thinnest that you can get (CoolIT has one that is almost as thin, but even that is still thicker) at 27mm high. 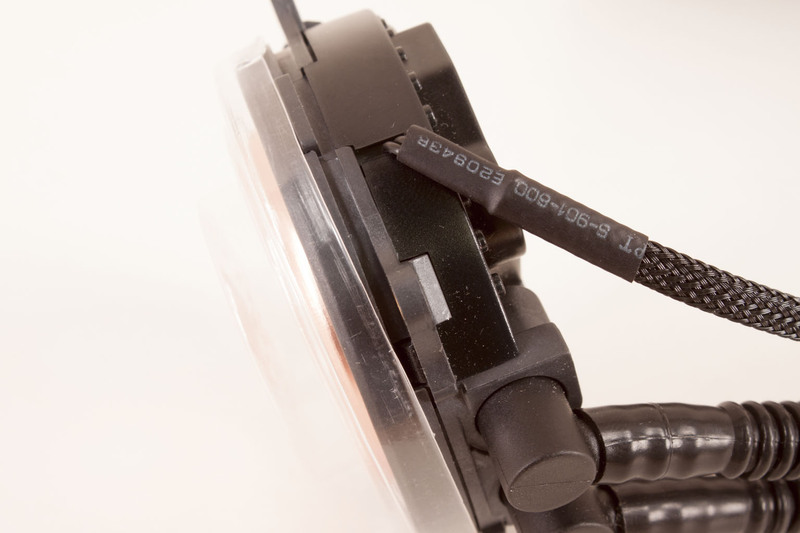 The water block is milled out of a single piece of copper and utilizes “micro-channel” technology to ensure consistent and even cooling across the entire head (this is also a common feature). This is connected to the radiator via what appears to be pretty standard Teflon hoses. The radiator is also 27mm thick and 150mm tall and 118mm wide. This is more than enough room for a 120mm fan to push air through the cooling fins. Speaking of pushing air, Cooler Master has included a 120mm PWM fan that is capable of running between 600 and 2400RPM to make sure that you can keep things cool when you need it as well as quiet. The overall impression is that the Seidon is fragile, but it is anything but. 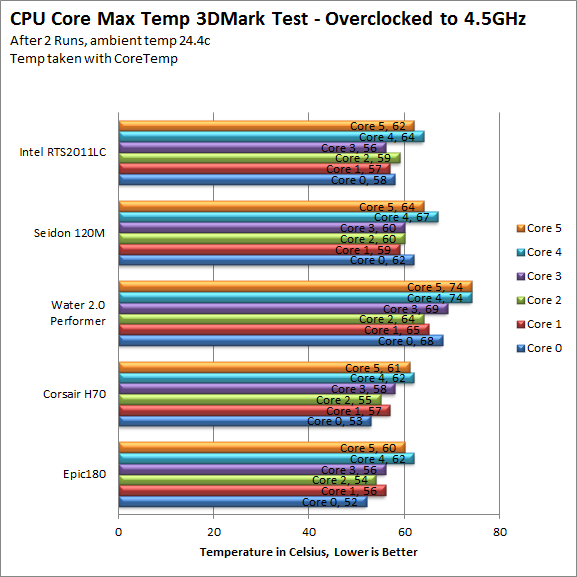 Now we just need to see how well it does its job and if the thin cooling head combined with the thinner radiator will be able to keep up with our 3960X, I guess we will see shortly. To further enhance the fact that the Seidon is not an Asetek head the installation is completely different. Instead of the tabbed mount and head that we see on most other coolers you have different brackets that attach directly to the head with small screws. This is very similar to what you see with Cooler Master’s air coolers. Once you get the mounting arms in place you getting the Seidon firmly installed is almost no work at all. You can see how simple it is in the video we have posted below. 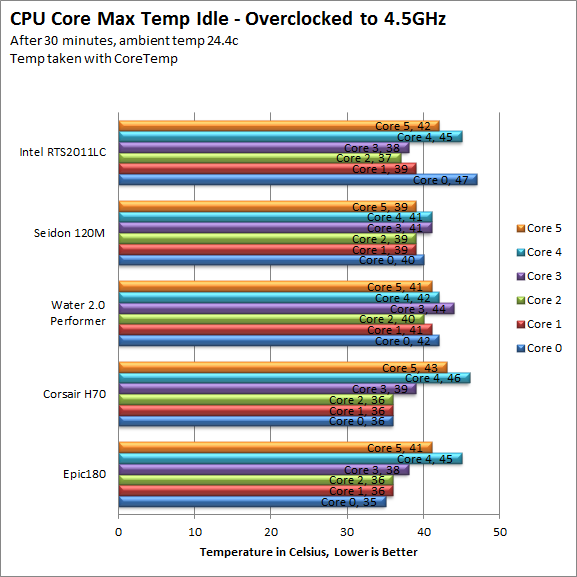 To see how well the Cooler Master Seidon 120M is at cooling we compared it to four other self-contained cooling units. The MAINGEAR Epic 180, Corsair H70, Thermaltake’s Water 2.0 Performer, and Intel’s own water cooling rig for the new Sandy Bridge E CPUs the RST2011LC. 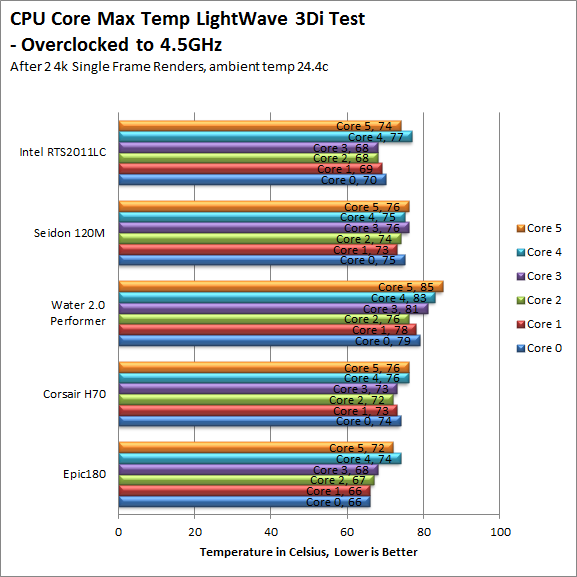 To get the best idea of how each of these performs we set up a battery of three CPU intensive tests. Each is capable of bringing the CPU to 100% for an extended period of time. 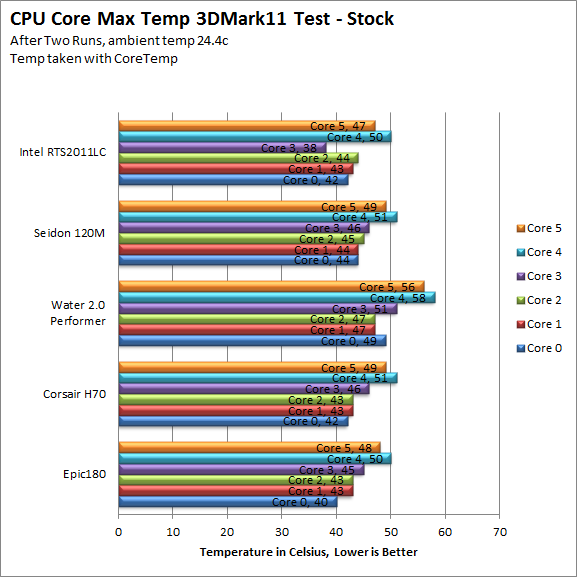 Each of these tests was run twice at Stock Speeds and then again overclocked to 4.5GHz. We ran the two test runs back-to-back and then the maximum recorded temperature for each core was recorded. To record these we used CoreTemp. 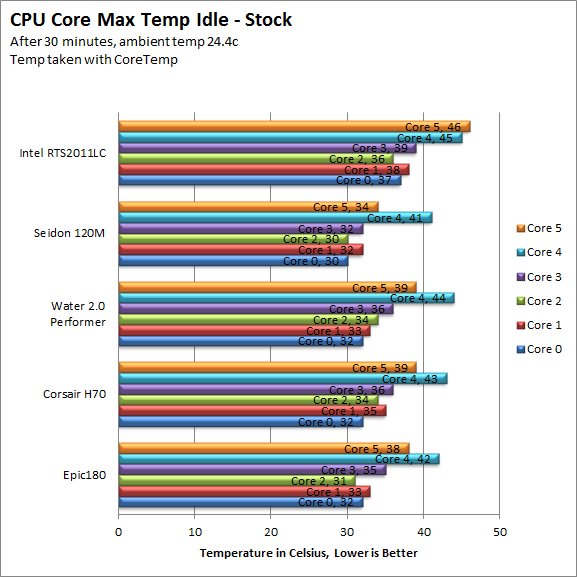 At stock speeds the Seidon does a very good job of keeping your CPU cool, in fact it is better than some of the coolers with a thicker radiator (which can mean more cooling area). When overclocked and at stock speeds the Seidon starts to slip, but not too badly; this is probably due to the cooling area in the radiator becoming saturated with the extra heat. We will see how it does under stress below. Here the Seidon did well keeping things cool at stock speeds but when we pushed the 3960X to 4.5GHz the extra voltage needed to reach this speed seems to be more than the combination of pump, radiator and fan can deal with. The temps are not bad; in fact they are very close to other solutions that technically have more cooling surface in the radiator. 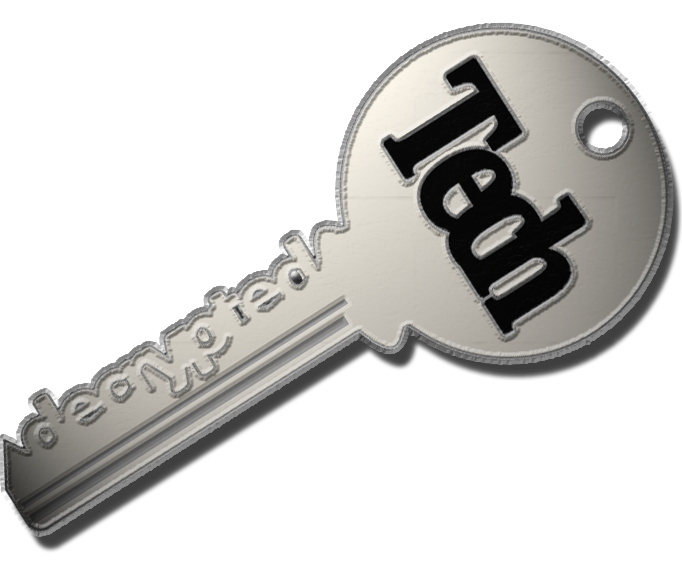 HyperPi is a front end application that allows you to easily run multiple instances of the SuperPi application. SuperPi, for those that are not familiar with it, is an application that measures the time it takes to calculate the number Pi out to as many as 32 million places. This calculation is then checked and run multiple times (up to 24 for a 32M run). This test stresses the CPU, Memory and HDD as data is handed off between the three. If there is a weak link, HyperPi will show it. 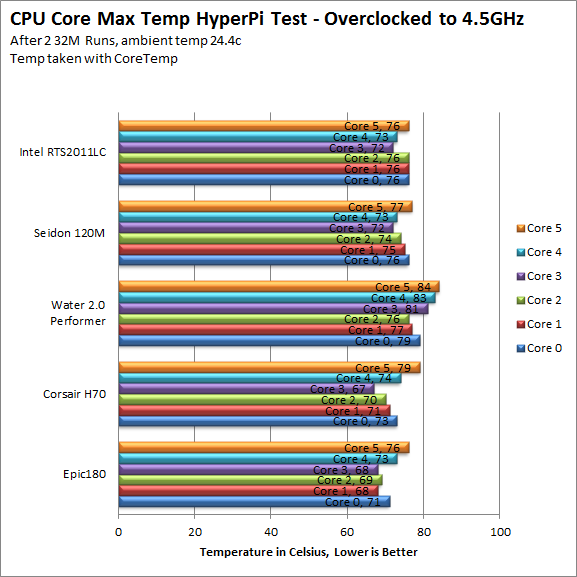 For our testing we run the 32M test on as many cores (and threads) as the CPU has available. HyperPi is one of those tests that can really push your CPU and also get it heated up. 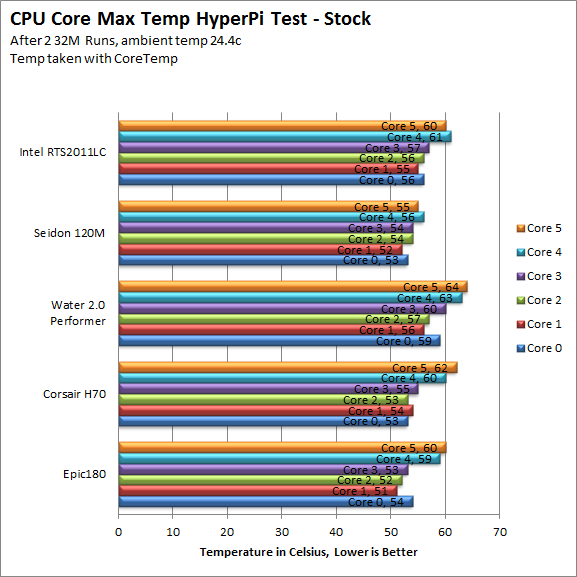 Although some like running Prime with small FFTs we have found that HyperPi is a better thermal simulation for real world testing. Here we see that the Seidon does well again, it is not the best cooler in the group, but it does very well for its design. Lightwave is another industry standard application for 3D animation and rendering. It has a large tool base and the rendering engine is highly threaded (when using the right render model). This application is also capable of expanding to 4k resolutions as well as ray tracing for rending the light sources. For our testing we use frame 470 of the Pinball scene found in the LW 9 Content folder. This uses the newer perspective camera that is better suited to a multi-CPU/Core environment. This camera style also uses ray tracing and a much improved anti-aliasing method. Settings are shown below in the attached screen shot. The Seidon does very well again in our testing with temps that were much lower than we expected given the design. Even overclocked when we expected the system to become saturated it held its own and gave a good fight to the other coolers in our test group. The Seidon is around $55.00 from most online stores. This makes it quite a bit less expensive than many all-in-one coolers out there. For this amount of money we would not have expected the high-quality build and specs. Normally at this price level things can become a little flimsy while the performance also drops considerably. Considering the performance that we saw from the Seidon $55 is a great value and one that we can get behind. The Seidon was not the best all-in-one we have ever tested; it was not even the second best. However it is the best all-in-one we have tested at the price point it is at. We have yet to see a cooling system like this for under $80 that can maintain decent performance when pushing an overclocked top-end CPU. We were pleasantly surprised to see the temps that we did from the Seidon. 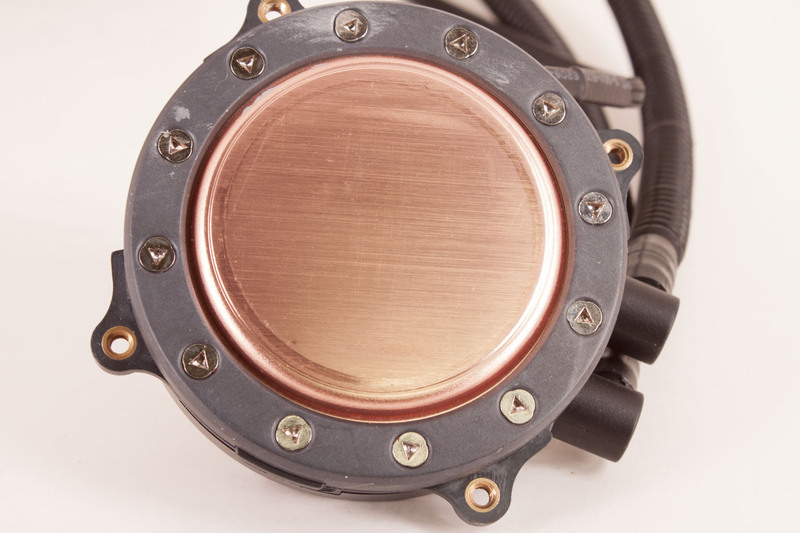 We do think that Cooler Master has some room for improvement; they could have added a copper radiator to increase the thermal dissipation and also included better thermal interface material for use in mounting this on your CPU. Perhaps in future models Cooler Master will add in liquid metal and a copper radiator as an “enthusiast” option. If they did the Seidon would be one amazing product. As it stands we are still able to recommend it to any of you that are interested in adding water cooling into your rig, but do not want to build it piece by piece. In fact the Seidon is good enough to earn our Silver Key award for its build quality, price and performance.